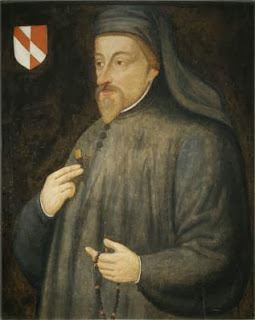 Geoffrey Chaucer (1340–1400). The Prologue to the Canterbury Tales. When polite English society conversed in French - considering English a vulgar tongue, fit only for servants and working people - Chaucer, nevertheless, wrote poems in this "vulgar" English, which charm us because of their quaint words. [Editor's Note: This passage contains extensive footnotes. To prevent the disruption of reading, these are all included at the end]. And at a knight than wol I first biginne. Trouthe and honour, fredom 24 and curteisye. In listes thryes, and ay slayn his foo. And of his port 43 as meek as is a mayde. He was a verray parfit gentil knight. And wente for to doon his pilgrimage. With lokkes crulle, 51 as they were leyd in presse. Of twenty yeer of age he was, I gesse. And wonderly delivere, 53 and greet of strengthe. In hope to stonden in his lady 56 grace. Short was his goune, with sleves longe and wyde. Wel coude he sitte on hors, and faire ryde. Iuste and eek daunce, and wel purtreye and wryte. He sleep namore than doth a nightingale. And carf 60 biforn his fader at the table. And in his hand he bar a mighty bowe. A not-heed 65 hadde he, with a broun visage. Of wode-craft wel coude 66 he al the usage. A forster was he, soothly, as I gesse. And she was cleped 72 madame Eglentyne. That no drope ne fille up-on hir brest. And to ben holden digne 83 of reverence. Caught in a trappe, if it were deed or bledde. And al was conscience 87 and tendre herte. But sikerly she hadde a fair forheed. For, hardily, 92 she was nat undergrowe. Ful fetis 93 was hir cloke, as I was war. That was hir chapeleyne, and PREESTES thre. A manly man, to been an abbot able. And held after the newe world the space. This is to seyn, a monk out of his cloistre. But thilke text held he nat worth an oistre. And I seyde his opinioun was good. As Austin bit? 108 How shal the world be served? Lat Austin have his swink to him reserved. A love-knot in the gretter ende ther was. And eek his face, as he hadde been anoint. His botes souple, his hors in greet estaat. He was nat pale as a for-pyned 118 goost. A fat swan loved he best of any roost. A limitour, 119 a ful solempne 120 man. So moche of daliaunce and fair langage. Of yonge wommen, at his owne cost. Un-to his ordre he was a noble post. For of his ordre he was licentiat. He wiste that a man was repentaunt. He may nat wepe al-thogh him sore smerte. Men moot 127 yeve silver to the povre freres. And pinnes, for to yeven faire wyves. Of yeddinges 130 he bar utterly the prys. Ther-to he strong was as a champioun. To have with seke lazars aqueyntaunce. But al with riche and sellers of vitaille. Yet wolde he have a ferthing, er he wente. And rage 141 he coude as it were right a whelpe. In love-dayes 142 ther coude he mochel helpe. But he was lyk a maister or a pope. That rounded as a belle out of the presse. As doon the sterres in the frosty night. This worthy limitour was cleped 145 Huberd. Sowninge 149 alway thencrees of his winning. Wel coude he in eschaunge sheeldes 152 selle. But sooth to seyn, I noot how men him calle. But loked holwe, and ther-to soberly. Ne was so worldly for to have office. Ther was also, ful riche of excellence. Of fees and robes hadde he many oon. So greet a purchasour 170 was nowher noon. That from the tyme of king William were falle. And every statut coude 177 he pleyn by rote. Of his array telle I no lenger tale. Note 1. Its sweet showers. Note 6. The sun left the sign of the Ram about the middle of April. Note 16. Made comfortable in the best style. Note 28. Sat at the head of the table. Note 35. In Asia Minor. Note 36. In Asia Minor. Note 41. In Asia Minor. Note 45. Kind of person. Note 49. Coat of mail. Note 55. Considering his youth. Note 63. It pleased him. Note 65. Closely cut hair. Note 67. Arm-guard of leather. Note 69. Image of St. Christopher, his patron saint. Note 70. Cord or belt. Note 71. I. e., she did not swear at all, like St. Eligius. Note 74. A convent near London. She spoke Anglo-French. Note 76. Upper lip. Guests drank out of a common cup. Note 81. Took pains to imitate courtly manners. Note 95. Having every eleventh bead green. Note 96. Love conquers all things. Note 97. In the highest degree. Note 98. He had charge of the manors attached to his monastery. Note 108. As St. Augustine bids. Note 118. Wasted by torment. Note 119. Holding a license to beg within certain limits. Note 121. I. e., of friars. Note 124. Where he knew he would get a handsome present. Note 134. It was not fitting in a man of his ability. Note 139. John I, I; was used as a greeting. Note 140. This probably means that he made more out of his begging than he paid for the privilege. Note 142. Days for settling differences out of court. Note 151. At any cost. Note 158. Gone, devoted himself. Note 159. Outer short coat. Note 164. Go to school. Note 168. The portico of St. Paul’s where lawyers met. Note 171. All forms of land-holding were as easy for him to handle as fee-simple. Note 174. He had definite knowledge of all cases and decisions. Note 176. Find fault with.